Let me briefly explain on this page what and how many factors influence the management of a cattery and therefore determine the price of the animals. I hope that this will enlighten novices about the amount of work that each and every kitten requires. Each cat breed is the result of a process of selection based upon its ancestors. The process involved people, time and dedication. If you buy a purebred cat you are guaranteed a particular look and personality which is possible only because of meticulous research and study work. Also, if you have the privilege to come across the offspring of award-winning cats (Grand International Champions, European Champions, etc.) the cat is even more valuable because it has a good chance of inheriting the excellent quality and morphological traits of the parents. To start a breeding program it is necessary to have at least one queen. Finding a suitable queen can take a long time, and certainly a great deal of money. If you then decide to purchase a stud cat (necessary to start a descent), it will need to be an excellent representative of the breed and an exhibition stud cat can cost a lot more than the usual price for pet kittens. A breeding program requires proper, well managed space, compatible with the number of cats present. As the cattery increases, you will need to create new spaces not only for available rooms, fences and runs but also scratching posts, berths, litters and all you need to share your space with the cats. A health-conscious cattery has at least one annual visit for all its cats (including the neutered ones). This includes a general visit, trivalent vaccines, and vaccines for FIV / FeLV. If, sadly, a cat becomes sick, the costs rise to unimaginable levels. Unfortunately cats are creatures that often suffer from easily transmittable diseases that can bring severe consequences (e.g., the common cold can develop into pneumonia, chronic rhinitis, etc.). A serious cattery, as well as being attentive, has to test their cats for the set of genetic defects typical of the breed. However, these tests, which should be repeated annually for each breeding stud cat, represent a cost (in terms of annual ultrasound and / or DNA testing) to the breeder who ensures the health of the kitten, and consequently affects the final price. You cannot expect to have beautiful and healthy cats by feeding them cheap food, purchased in the first hyper-discount you find. These monetary savings are destined to become the veterinary expenses necessary to treat disorders and deficiencies caused in the long run by poor nutrition. The feeding of cats requires specific Super Premium quality food, available only at specialty stores at very different costs from those for cheaper brands found in supermarkets. Every litter is a joy but costs add up. First, the dam should be monitored with an ultrasound immediately after queening to prevent the onset of possible post partum infections. If the litter is large, the milk must be supplemented with formula milk for the kittens (which costs the same as powdered milk products for human use! )Milk is administered with a special bottle from the early days of life and for at least 3 weeks, every 3 - 4 hours, including nights. The kittens are de-wormed and vaccinated. To better promote the development of their digestive capacity they should be weaned onto food of the highest quality and, at times, helped with supplements that accompany growth. Throughout lactation, the queen will continue to have a growing daily energy requirement, which will return to its usual level after the kittens are completely weaned. Once the kittens are weaned, the queen needs to recover. It may be necessary to resort to dietary supplements. Exhibitions are a necessity for a serious breeder because, results aside, they allow him to compete with other breeders and discover possible errors in his selection process. 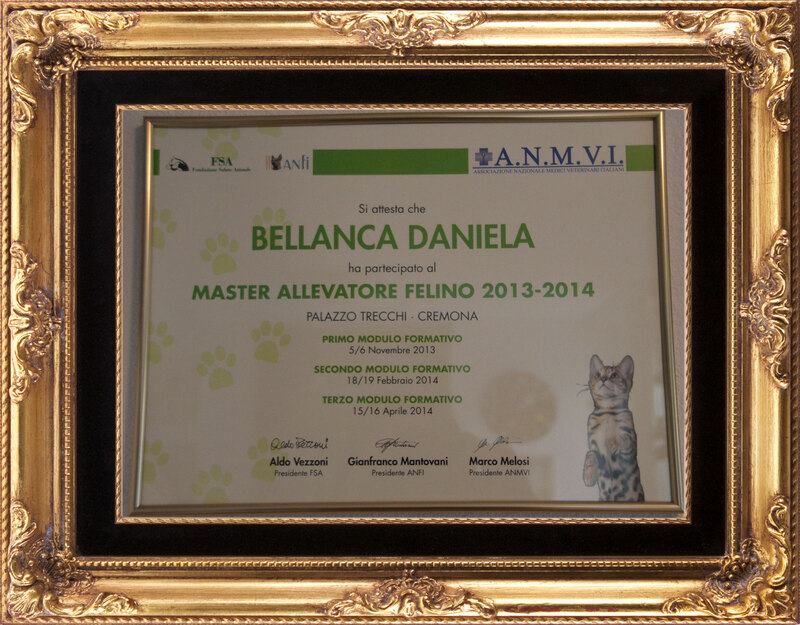 Often a breeder travels around Italy and abroad to visit exhibitions. Each exhibition may bear costs for tolls, petrol (or a plane ticket for at least one person plus the cost of transporting the cat and equipment), hotel and subsistence. Making your name known in the sector could also mean placing advertisements in magazines and specialized websites which can cost hundreds of Euros every year. Although minor compared to the other items, the costs for birth certificates, pedigree requests (for each kitten), annual subscription to FFH and the annual registration for the name of the cattery become part of the final budget. Breeders are not born but made. To become one, as well as passion and dedication, study and training are required above all. Books on genetics, biology, ethology and magazines cost money and require time and effort to be assimilated. Cats need to be kept in a clean and safe environment. The specific products have high costs.